This large carrying bag measures 16x16 and opens by roughly a foot. Plenty of space inside the roomy bag. It has a collage of Bingo theme on the side. Bingo daubers sold seperately. This large carrying bag measures 16 inches across. Plenty of space inside the roomy bag. It has a collage of Bingo theme on the side. 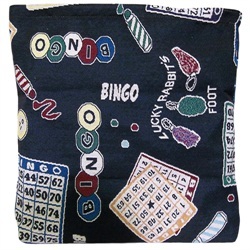 Bingo daubers sold seperately.